Last year, eSports got a reality check. Speaking in an interview, pro Counter-Strike player Kory "Semphis" Friesen openly admitted that he and other players had taken the performance-enhancing drug Adderall during a tournament. "We were all on Adderall," he said at the time. "I don't even give a f**k. It was pretty obvious if you listened to the comms." The Electronic Sports League, which hosted the tournament Friesen was part of, knew it had to respond: shortly after the scandal came to light the ESL announced it would start random drug tests, starting only days later. Performance Enhancing Drugs are a problem that traditional sports, particularly the more athletically intense, continue to battle, but their involvement in eSports has been ignored or at least deemed unimportant until very recently. That is, in part, because eSports isn't what most people would consider "athletic", but Adderall - a drug often used to treat attention deficit hyperactivity disorder - and other amphetamines can give users laser-sharp focus. That's a beneficial edge in Counter-Strike where split-second reactions are the difference between hundreds of thousands of dollars and walking away with nothing. These benefits extend to other tournament games like League of Legends and Starcraft 2 also. According to the ESL, none of the tests, which involve a taking a swab of saliva, have returned positive since the program started last year. That no players have been found doping so far is both "good and bad" according to Ralf Reichert, CEO of ESL's parent company Turtle Entertainment. "It will happen that someone will get caught sooner or later," he says, "It's the reality of every sport out there." As eSports grows into more of a mainstream institution, the more it will start to converge with traditional sports. That means more money will be thrown into it, prize pools will become larger, and people will go to greater lengths in order to win. 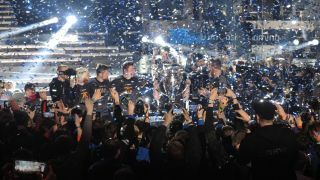 The league keeps drug-testing figures confidential, but several players who took part in this year's Katowice Intel Extreme Masters told techradar that they or a member of their team had been tested for the event. An ESL spokesperson told us that players are selected using names drawn out of a hat, and the examination itself is a saliva test. In 2013 the International eSports Federation became the official signatory of the World Anti-Doping Agency, but it wasn't until last year, in the wake of the Friesen scandal, that the ESL announced it would work with WADA and NADA (Nationale Anti Doping Agent) to adopt their lists of banned substances. But having a Hearthstone player jacked up on steroids probably isn't going to give them a strategic advantage, and so the ESL has come to recognise that a more considered approach is needed. "First idea was just, we'll just work with them and it's all going to be fine, but we figured out it's a little more complicated than that," says Reichert. "They have obviously very different needs, so their lists of substances that are bad are not really fitting to eSports." Other eSports organisations have started taking on anti-PED measures, or are considering it. Last year, DreamHack said it was considering bringing in testing in the future, while Glen Elliott, founder of European Gaming League, told us that the EGL currently doesn't do anti-doping tests but is "looking into" the issue at the moment, and searching for the right partner to help it. Testing isn't cheap, and the ESL has the luxury of deep pockets, but it probably won't be too long before this is no longer an optional luxury for eSports organisations. "I've been to several Call of Duty events, and you hear the term Adderall thrown around like it means nothing," says Roger R. Quiles, an attorney who specialises in eSports. "And it's kind of scary from that perspective because you don't really know whether or not it's in jest or if it's being honest. I know that community has had a lot of issues with Adderall usage." "You hear the term Adderall thrown around like it means nothing"
The punishments for taking PEDs are much like penalties in traditional sports: players can be banned from partaking in future tournaments and sponsors may pull their support. "No one's gonna openly admit to it like [Friesen did]," says Quiles. "The legal risks are tremendous. Even from simply a sponsorship perspective, you can lose all of your sponsorships for doping." "These contracts have morals clauses which allow them to terminate if you bring yourself into serious disrepute. Depending on how the player contracts are drafted, you could potentially lose your spot on the team." Certain prescription drugs will always be ripe for abuse to help calm players' nerves and put them "in the zone". "In the US, Adderall is way over-prescribed, and it's quite easy to get a prescription," says Quile. Couple that with the fact the amount of mental stamina demanded by eSports events, and you start to get a good idea of why this became a problem in the first place. Even while writing this feature, we were pitched a story about a new powder designed to enhance gaming performance. Mannantech, the manufacturer, told us that the powder is made "without any substances banned by major anti-doping agencies" and therefore wouldn't be classified as a PED. Yet, it foreshadows a problem in deciding what should and should not be defined as a PED in eSports. "The unfortunate reality of it is that when you get down to these tournaments, they're incredibly long," says Quiles. "And from a player perspective, you may have one match at 10 in the morning and then your next match may be at eight o'clock at night. And you've got to ramp up for the first match, and then obviously you have that long layover, and then you have to ramp up for the second one. "So it's easy to see where that notion of 'maybe I need something to give me an edge' comes from." At Katowice, the ESL spoke openly for the first time about its plan for a coalition - an "integrity initiative" - to regulate problems of doping, cheating and match-fixing in eSports. It's an ambitious, UN-style proposal that will need much joined-up thinking. "We're in the middle of setting this up, so this is not a done thing," Reichert tells us. "It's only going to work long-term if it's an industry-wide initiative". Right now the ESL is working alone to lay the foundations for the initiative, but it hopes to brings other organisations and partners into the alliance soon. In an interview, Intel's Global Sponsorships Manager George Woo confirmed that Intel is "definitely" looking to be a partner of it. "To legitimise eSports you have to put these parameters in," he said. It all sounds very promising, but eSports is still a burgeoning industry trying to find its feet. "The market is very fragmented at the moment," says European Gaming League's Glen Elliott. "It's been likened to boxing and darts - everyone's got their own view and mindset of where they want to take eSports." The problems go beyond doping, too. Match-fixing is another prickly problem - one that's also trickier to tackle. Earlier this year, Valve ruled that a group of professional Counter-Strike: Global Offensive players, which had been suspended for match-fixing in 2015, would be banned indefinitely from all future Valve-sponsored events. It set a gold standard for the industry, but that doesn't mean the problem is going away any time soon. The ESL announced last year that is was joining forces with Sportsradar, a sporting organisation that is helping it understand how to fight fraud. Again, as eSports starts to mimic traditional sports - the money, the spectacle, the celebrity culture - the more that organisers will have to align their thinking as such. "We've had match-fixing scandals, says ESL's Ralf Reichert. "Not on a large scale, but we did, absolutely. I'm not sure when the last one was. We definitely know that this is a real thing." As is cheating, another tough cookie. Cheating is less of a concern when you hit live tournament play, but it's still rife at the lower levels. It brings its own bag of complexities too, chiefly: what classes as a "cheat"? If a player discovers an exploit in the map and chooses to use it, should he/she be punished? It's in cases like this - a problem that arises more in console-based tournaments - that the lines become fuzzy, but at least exploits can be resolved by alerting game publishers, which can then deploy patches. When it comes to players using software to cheat the game, extra vigilance is needed. Last year the ESL confirmed it was buying the ESEA, which would not only help the organization expand its North American presence but also give it access to the ESEA's notoriously robust CS:GO anti-cheating technology. "Cheating live is a smaller issue," says Reichert, "so actually what we do there is to check the equipment of the players before they got to a PC, because you can still install something where you aim better etc, small tweaks." "If you play online there are cheats where you can look through walls, or the computer aims for you, and things like that. So that is much more challenging, and that is a big thing across most of the games". Drugs, cheats and match-fixing are giving eSports plenty to think about, but there's a bigger problem that can't be fixed by acquisitions, software patches or tests. Diversity is another concern for eSports right now, with a particular focus on the lack of women playing at the top levels. The gap is starting to close thanks to sponsorships for women's teams being pledged by the likes of Intel, but you can't throw money at attitudes, and it's attitudes that ultimately need to change to ensure that diversity improves as the eSports industry scales up. When you look away from eSports and to the entire audience of gamers, the gender split is almost completely even, and yet you wouldn't know it were you to attend an eSports tournament right now. It's certainly not through lack of skill, but through lack of numbers that women are so poorly represented at the top. When it comes to good online citizenship, eSports isn't a lot better than most districts of the web. Harassment and trolling happen, not so much at the higher levels, but female players especially deal with it as they work their way up to the pro leagues - part of the reason that many are put off from pursuing further. "I know for a fact that in the lower ranks of CS:GO there is more harassment," says Hege Botnen, a professional Counter-Strike: Global Offensive player. But at the higher levels, she says, it tapers off. "There's almost none of it. I have absolutely no idea why this is but it's just a trend that I see." In February, the ESL and Intel announced a joint initiative called AnyKey. Its goal is to improve diversity within eSports, researching the problems foremost and then implementing solutions. Its statement reads: "Our Mission is to help create fair and inclusive spaces in eSports for women and other underrepresented gamers." Intel used the Katowice Extreme Masters as the starting pistol for its AnyKey initiative. In the expo area, men lined up for a photo with one of many "booth babes" patrolling the area. Inches away, AnyKey representatives offered leaflets about promoting LGBTQ players, people of colour, and women. One picture, a thousand words. It will take some time for the AnyKey project to prove its effectiveness, but diversity is also part of the proposed alliance. It's an initiative that, effectively - considering the embryonic state of the industry - want to nip its problems in the bud. The field of eSports is set to grow significantly in the next few years, and in some ways eSports has a head start on integrity problems that many traditional sports are still firefighting. "The level of the female teams that are participating is increasing," says Botnen, optimistically. "As more and more women start playing and increasing their level I think it will have an effect on the entire [industry], this trickle down effect, it will come down and it will improve." "It's a mindset, but it's going to change. It's changing."